LONDON -- Rev. Billy Graham once said, "Sincerity is the biggest part of selling anything, including the Christian plan of salvation." In London, CBN News met a renowned artist whose sincere search for God has made him a most unlikely evangelist. Charlie Mackesy has been described as "a world class artist," selling artwork to the likes of Whoopi Goldberg and Sting. He invited CBN News into his home that doubles as an art studio in the Brixton neighborhood of London. Surrounded by dozens of his paintings, drawings, we ask when he discovered he had artistic ability. "It's a good question; I mean, I think I probably knew that I could draw at school," Mackesy said. "But I think you need a reason to draw." He found that reason about 25 years ago, in a London park. An atheist at the time, he said he had a feeling "that there must be more to this than meets the eye," Mackesy said. "Jesus quietly introduced me to a journey into finding people really beautiful, which is how my art really began," he said. "Because I felt inside me he was going, 'Look. How beautiful is that guy sitting on that bench?' And I would have never noticed him before." 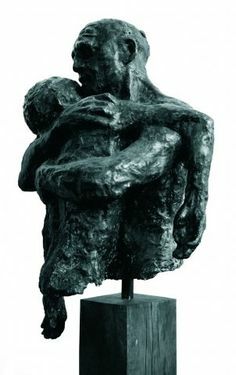 One of his most notable works is a bronze sculpture, called "The Return of the Prodigal Son," wherein Mackesy captures the raw emotion of the familiar parable. It's located at Holy Trinity Brompton, one of the most influential churches in the Church of England. Mackesy is a popular speaker in England, particularly with unbelievers. "Charlie appeals to people outside of the church because he's not what they expect," Vicar Nicky Gumbel explained. "You know, when you have the sort of picture of 'the evangelist,' you don't picture Charlie Mackesy, and I think that's what's so wonderful about him." Mackesy can be a bit unorthodox. One day he told the story of hearing a gospel song for the first time, at a music festival, inside a portable toilet that was so filthy he stood on the seat to avoid the overflow. Describing the scene to the congregation, he played the gospel song "Oh, Happy Day," performed by The Edwin Hawkins Singers. Mackesy related how the song pierced through his atheism, moving him to tears. "In the loo. Bawling," he said. "Atheist, atheist, bawling." "He's very humble, very unpretentious," Gumbel said. "He tells stories against himself." "I didn't really know what had happened to me," Mackesy continued. "But as I was feeling it, my left foot slipped. And I went up to here in..."
He paused to let the audience fill in the blank. While Mackesy's stories may not be for the faint of heart, he points out those closest to Jesus, the disciples, could also be described as objectionable. "I realized that they were naughty people, unreligious people," Mackesy said. "People who didn't really have a religious etiquette, and probably wouldn't be that welcome in church." After the congregation recovers from the most graphic part of his "loo" story, Mackesy made his point. "I thought Christianity was: be clean, come to church, be nice, don't use the 'F' word, and you'll be accepted and liked, because that's the thing; it's a meritocracy," he explained. "And if you want to belong, be a certain way." "'You're loved. You're loved as you are. Covered in whatever it is, on the inside or out," he continued. "I think he's the finest evangelist in the U.K. at the moment," Gumbel said. "People outside the church, I would rather take them to hear Charlie than anybody else in the U.K."
When Mackesy learned how Gumbel describes him, he bursts into rollicking laughter. "That's completely ridiculous!" he exclaimed. This all came as a shock to Mackesy, which is understandable given his life story. "We had kind of religious things at school and I hated it," he explained. "We sang about God, but I didn't like God. I didn't think he existed, but if he did, I didn't like him." When asked how he would have described a Christian, he instantly replied, "Oh, as someone who pretends to be good and judges people. And believes in an invisible friend that they've created." After that strange yet profound encounter with "Oh, Happy Day," Mackesy moved to New Orleans, immersing himself in black gospel music and jazz. "I wanted to say to my friends, 'There's a spirit behind this that is incredible; it's so full of life. Look at it. Look at these people. Look at what they believe, look at what it does to them,'" he said. 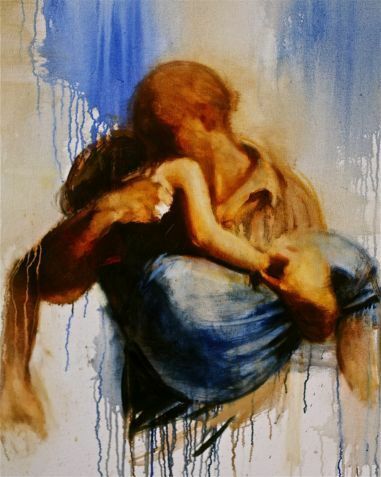 Mackesy sees his art foremost as a way to introduce God to the people he loves - like "Prodigal Daughter," made for a friend who struggled with bipolar disorder. "You know, if you tried to explain in words like, 'Oh, God loves you,' or, 'You're loved,' they don't really carry any meaning at all," Mackesy said. "And I think for me I was just trying to show her through imagery where, you know, to be held is something she always wanted. So I said, 'This is what God is like,'" he said. 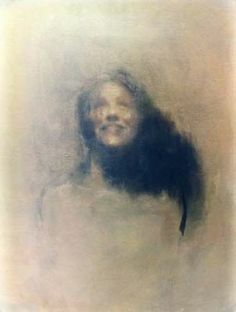 Mackesy's art is also a record of God's presence in his own life. 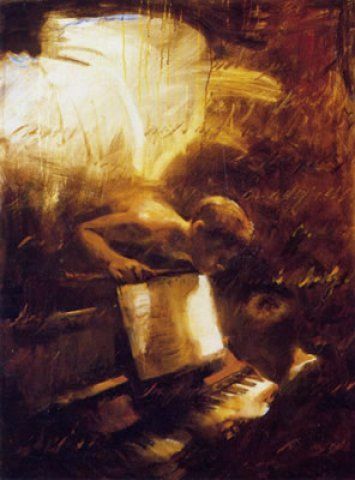 "I really wanted to play the piano, but I was really rubbish," he recalled. "And for me, the angel represents the voice of God saying, 'I'm with you. I love you. We'll go there together. I'll help you with this. You're not alone.'" And another painting, simply titled "Known." "There was one day when I was on my bike crossing a bridge in London, and it lasted about 11 seconds," he remembered. "But it was this kind of [Notes:sound effect] 'You're known, you're loved, this is, God exists and He loves you, He knows you, you're known, you're fully known, you're fully known.'" "Warts, darkness… You don't have to pretend to be anything," he marveled.